The driving club kicked of with the first event of the year with a charity drive run by the NI-BDS held at George Fawcett Carriages. Proceeds went to Parkinson’s UK & Ward 9 Ulster Hospital. 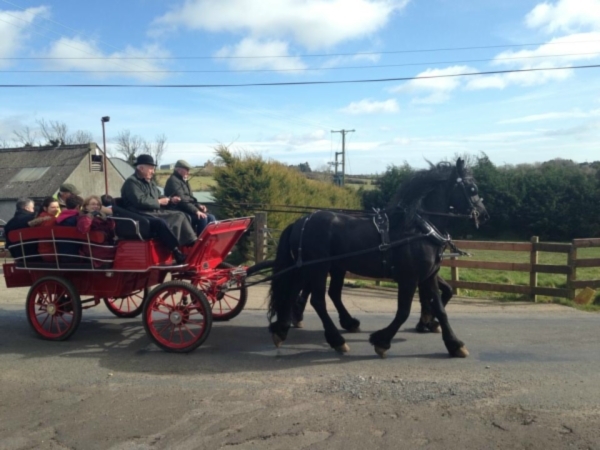 We had 9 turnouts who all drove the 6 mile lap from our yard, through saintfield, out the by the cattle market and back to our yard. We spent the rest of the afternoon eating soup, stew and sandwiches. The weather was great and the craic was good! We raised over £300 which will all go to a great cause. This is the 3rd year we have hosted the drive with it usually being held on New Years Day but this year held on the Bank Holiday weekend. Thanks to all those involved who brought horses, food or hands to help!